Tópicos: Bike Brands, Accessories, Retailers, Madd, e Sponsored Events. 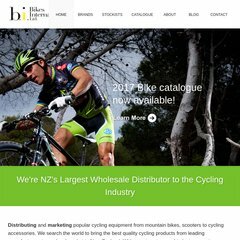 bikesinternational.co... he world is changing. In this day and age the bicycle sits at the ..
bikesinternational.co... MERIDA Features. Quality that can be seen. 96 usuários visitam o site por dia, cada um entrando em 4,80 páginas. A linguagem de programação utilizada é Phusion Passenger (mod_rails/mod_rack) 3.0.7. Há 2 Nameservers: ns2.orcon.net.nz, e ns1.orcon.net.nz. Está hospedado em Sitehost New Zealand Auckland, utilizando um servidor nginx/0.